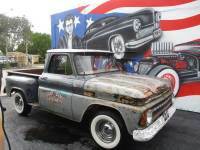 ...GET IT SHIPPED Free Auto Shipping Quote: 1965 Chevrolet C10 Pickup truck short bed 350 short block. Great project. Runs. Good investment.